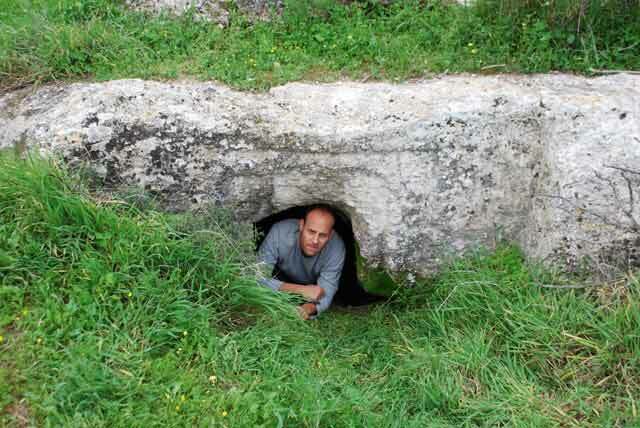 In February 2013, a rock-hewn burial cave was documented at Horbat Bet Natif (Permit No. A-6979/2013-02; map ref. 199272/622693), following an illicit excavation. The documentation, on behalf of the Israel Antiquities Authority, was undertaken by E. Klein and G. Goldenberg (photography and drafting), with the assistance of L. Rickman (artifacts drawing). Horbat Bet Natif is situated on a hilltop (439 m asl) in the High Shephelah, in the hills north of the Ha-Ela Valley, c. 1.5 km north of the ancient road from Jerusalem to Bet Guvrin. The site sprawls over several hills, around a center where an Arab village was until 1948. In the literature the site is usually identified as Pella (Πέλλα)/Bethletephenen (Βεθλεπτηνφών), the capital of the Judaean toparchy in the Second Temple period, which was conquered by the Roman army in 68 CE (Pliny, Naturalis Historia, V, 70; Josephus, Jewish War, III:55; IV:444-446). Excavations in and around the village during the British Mandate revealed burial caves, cisterns, remains of a workshop that manufactured lamps and figurines, coins from the time of the Jewish Revolt and the subsequent destruction, and remains of buildings with mosaic floors. These finds indicate that the site was occupied in the Second Temple period and in the Late Roman and Byzantine periods (for a summary of the finds see Zissu and Klein 2011). Two ritual baths and burial caves with ossuaries were documented in a survey on a hill northwest of the center of the site (Spot Height 422), a testimony to the Jewish nature of the region in the Second Temple period (Zissu 2001:152). A thorough survey of the site and its surroundings was conducted as part of the Ramat Bet Shemesh project (Dagan 2010). In July 2012, the entrance to a rock-hewn burial cave was exposed in the course of an illicit excavation at the top of the northern slope of the spur, west of the center of the ancient village. When the robbers fled, they left behind an intact Herodian lamp. The burial cave is hewn in the bedrock at the top of the northern slope of the spur. It has a hewn courtyard, and a smooth façade with an entrance surrounded by a stepped double frame (Figs. 1, 2). 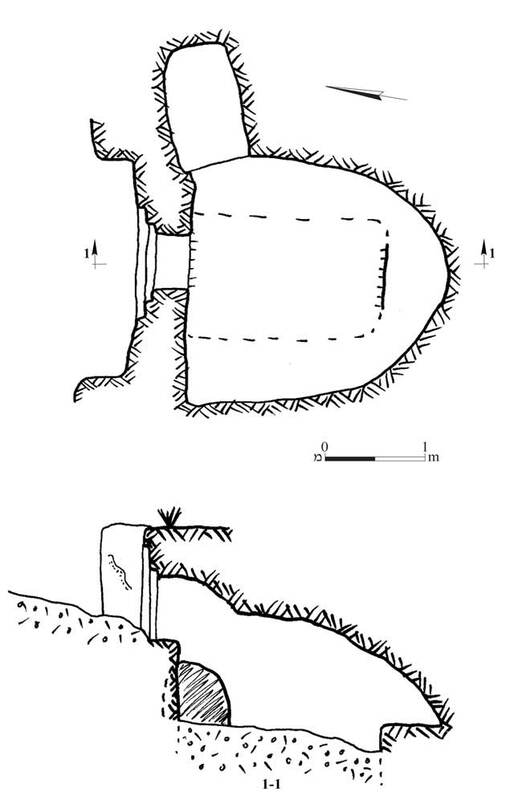 The entrance (width 0.6 m, height 0.7 m), which faces north, is 0.8 m above the level of the fill that covers the floor of the central burial chamber (length 2.6 m, width 2.4 m, height of ceiling above the alluvium fill c. 1.4 m). There was no sign of a step that would have facilitated entry. The northern wall of the burial chamber is straight whereas the other walls are curved. A rock-cut step in the southern part of the cave seems to indicate a standing pit in the center of the chamber, with burial benches arranged around it. In the northeastern corner of the cave there is a loculus, or bone repository (length 1.4 m, width 0.7 m, height obscured by the alluvium), in which the robbers left an intact Herodian lamp (Fig. 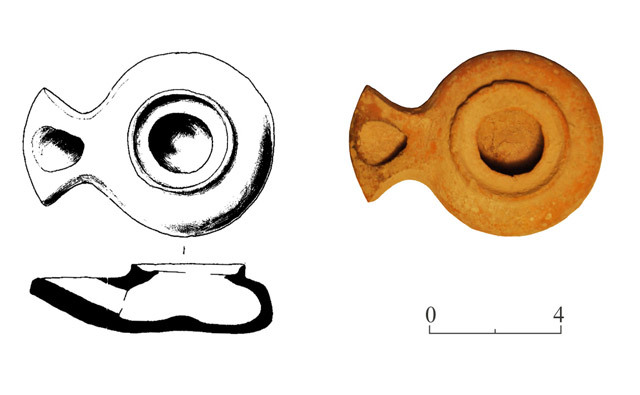 3); such lamps are known from ceramic assemblages that date from the Early Roman period to the first third of the second century CE (Rosenthal and Sivan 1978:80). The architectural elements of the burial cave include an entrance surrounded by a stepped frame, a standing pit and a loculus. All are common features in many of the tombs that were documented in the Jerusalem necropolis of the Late Second Temple period (Kloner and Zissu 2003). The Herodian lamp corroborates the assumption that the cave was adapted for burial in the Late Second Temple period, and was used by the residents of the large Jewish settlement at Bet Natif. The plan, of burial benches around a standing pit, may indicate that the cave had already been prepared in the second century CE (Kloner and Zelinger 2007). Kloner A. and Zelinger Y. 2007. The Evolution of Tombs from the Iron Age through the Second Temple Period. In S.W. Crawford ed. “Up to the Gates of Ekron”: Essays on the Archaeology and History of the Eastern Mediterranean in Honor of Seymour Gitin. Jerusalem. Pp. 209–220. Zissu B. 2001. Rural Settlement in the Judean Hills and Foothills from Late Second Temple Period to the Bar Kokhba Revolt. Ph.D. diss. The Hebrew University. Jerusalem (Hebrew). Zissu B. and Klein E. 2011. A Rock-Cut Burial Cave from the Roman Period at Beit Nattif, Judaean Foothills. IEJ 61:196–216. 2. The front of the burial cave, looking south.